Grant, Lord, we pray, that we may imitate what we worship, and so learn to love even our enemies, for we celebrate the heavenly birthday of a man who know how to pray even for his persecutors. Through our Lord Jesus Christ, your Son, who lives and reigns with you in the unity of the Holy Spirit, one God, for ever and ever. Today is the second day in the octave of Christmas. The Church celebrates the Feast of St. Stephen, the first Christian martyr. Stoned outside Jerusalem, he died praying for his executioners. He was one of the seven deacons who helped the apostles; he was "filled with faith and with the Holy Spirit," and was "full of fortitude." The Church draws a comparison between the disciple and his Master, emphasizing the imitation of Christ even unto the complete gift of self. His name is included in the Roman Canon. 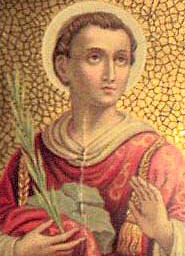 Saint Stephen is the first martyr of the Church, and is the patron of stonemasons, masons, bricklayers, deacons, headaches, and horses. His story comes from the Acts of the Apostles. He is usually pictured in deacon's vestments, holding the symbol of martyrdom, a palm branch. Sometimes he has a stone in his left hand, to indicate his death by stoning. He is depicted in many images wearing a wreath, which refers to the origin of his name, the Greek word Stephanos meaning "wreath." "If you know what witness means, you understand why God brings St. Stephen, St. John, and the Holy Innocents to the crib in the cave as soon as Christ is born liturgically. To be a witness is to be a martyr. Holy Mother Church wishes us to realize that we were born in baptism to become Christ — He who was the world's outstanding Martyr." — Love Does Such Things, by Rev. M. Raymond, O.C.S.O. The deacon Stephen, stoned in Jerusalem two years after the death of Christ, has always been the object of very special veneration by the faithful. He is the first martyr. The account in the Acts of the Apostles relating his arrest and the accusations brought against him emphasize the parallel with our Saviour's trial; he was stoned outside the city wall and died, like his Master, praying for his executioners. Stephen belongs to the group of seven deacons whom the Apostles associated with their work in order to lighten their load. He was "filled with faith and with the Holy Spirit," "full of grace and strength" he showed himself as a man of God, radiating divine grace and apostolic zeal. As the first witness to Christ he confronted his opponents with quiet courage and the promise made by Jesus (Mark 13.11) was fulfilled: ". . .Disputing with Stephen they were not able to resist the wisdom and the spirit that spoke." On the day after the solemnity of Christmas, we celebrate today the feast of St. Stephen, deacon and first martyr. At first glance, to join the memory of the "protomartyr" and the birth of the Redeemer might seem surprising because of the contrast between the peace and joy of Bethlehem and the tragedy of St. Stephen, stoned in Jerusalem during the first persecution against the nascent Church. They are a countless multitude, which the liturgy calls "the white army of martyrs," (martyrum candidatus exercitus). Their death was not a reason for fear and sadness, but of spiritual enthusiasm, which always gave rise to new Christians. For believers, the day of death, and even more so, the day of martyrdom, is not the end of everything, but rather the "passage" to immortal life, it is the day of the final birth, the "dies natalis." Thus is understood the link that exists between the "dies natalis" of Christ and the "dies natalis" of St. Stephen. If Jesus had not been born on earth, men would not have been able to be born for heaven. Precisely because Christ was born, we are able to be "reborn." Read Pope John Paul II's 2003 Angelus Message for the Feast of St. Stephen.